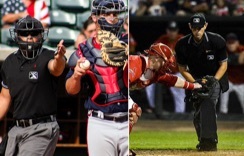 When an RV crashed on I-95, MiLB umpires Cody Clark and Brock Ballou sprung into action to assist its occupants, preserving the scene until police, fire, and medical services could arrive. While driving along the North Carolina portion of the highway enroute to a Carolina Mudcats game in April, an RV just ahead of the A Advanced Carolina League umpiring crew blew a tire before slamming into a guardrail, rupturing its undercarriage and fuel line, and littering the road with debris, all while one of the loose tires had flown free and smashed into the umpires' own windshield. After coming to a stop, Clark and Ballou ran to the disabled RV and found the door jammed while two off-duty detectives also traveling I-95 helped control traffic. When the RV's cabin became exposed, one of the items that fell out of the vehicle was a tool box containing a wrench, which Clark used to smash open one of the RV's windows before climbing in and checking on the elderly couple and their three cats within.